The Edwards 7008B-N5 120V Call for Assistance system is designed for areas where a call-for-help device is reuqired. The kit consists of a 7007B-N5 buzzer/strobe for audible and visual signaling and a 6537 emergency pull cord station for activation. Each component may also be ordered individually. The 7007B-N5 buzzer/strobe is designed for installation in a single gang 2" (51 mm) x 4" (102 mm)box located over doors. Each unit contains an audible signal which generates an 59 dBA sound pressure level at 10 ft. and a high intensity 150 candela strobe. The unit draws 115 mA. 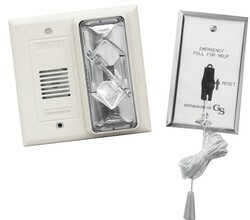 The 6537 pull cord station provides emergency call activation and reset. It has a stainless steel face plate with a DPST switch.